Contrary to popular belief 'Merica has a viable third political party: the party of non-voters, and its growing. This condition has led pundits to remark on the legitimacy of elected officials and the rise in power of unelected office holders such as judges, central bankers or transnational bureaucracies. In 2001, we watched the Supreme Court determine the outcome of a presidential election despite a popular vote count to the contrary. The "democracy deficit" worsens when a disillusioned segment of the population stops participating. * According to statistics these are the less educated and less affluent. 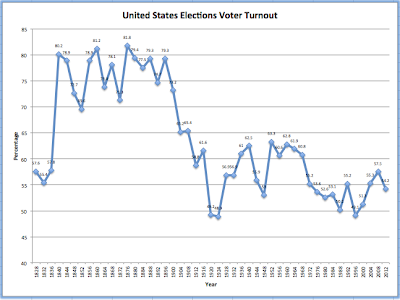 The chart [above] shows that voter participation in the last century hovered between 50-60%, substantially below the participation levels of the 19th century. No coincidence that some of the lowest participation rates occurred during the Depression era. In 1996 the 38.7% of the bottom fifth voted versus 72.6% of the top fifth. 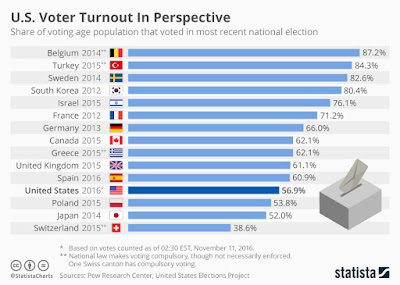 In the hung election of 2000 only 49% of eligible 'Mericans voted. Non college-educated white males constitute 55% of the electorate. They are substantially those who voted for billionaire Donald Trump and against feminist Hillary Clinton. Comparison of US voter participation with that in other developed republics is not flattering. It is among the lowest. [chart below] What has taken the place of politics in the US is a idolatrous belief in the marketplace as the efficient means of human governance. Absurd as it sounds, oil tycoon H.L Hunt published a book in the 50's advocating that citizens' voting power be measured by the amount of taxes they paid. This conflation of democracy with markets--the descendant of medieval carnivals--is dangerous in the extreme. As Senator Bill Bradley said during his candidacy for President, "failure to understand that democracy and capitalism are separate parts of the American dream, and keeping that dream depends on preventing one from corrupting the other." It would do well for 'Mericans to reflect on their decaying democracy and the rise of plutocracy as they celebrate their nation's founding this July 4, 2018, Anno Domini. *Phillips K., Wealth & Democracy 2002, pp 413-417.